Efficient communication and collaboration amongst physicians, nurses and other providers is critical to the coordination and delivery of patient care, especially given the increasingly mobile nature of today’s clinicians and the evolution of the accountable care organization (ACO) model. For healthcare IT leadership, the ability to satisfy the clinical need for more efficient communications technologies must be balanced with safeguarding protected health information (PHI) to meet compliance and security requirements. As a result, the industry continues to rely primarily on pagers, which creates inefficiencies that can have a considerable economic and productivity impact. 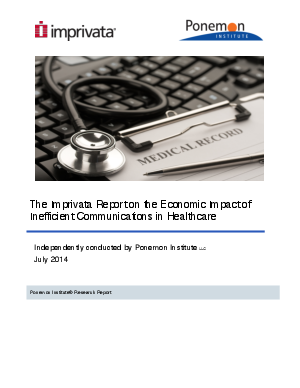 To quantify this impact, the Imprivata Report on the Economic Impact of Inefficient Communications in Healthcare surveyed more than 400 healthcare providers in the U.S. about the typical communications process during three clinical workflows: patient admissions, coordinating emergency response teams and patient transfers. Patient Admission: Admitting one patient takes about 51 minutes, of which an average of 33 minutes (65 percent) is wasted due to inefficient communications. This translates into an annual loss of about $728,000 per U.S. hospital. Emergency Response Coordination: Coordinating an emergency response team takes an average of 93 minutes per patient. Of this time, an average of 40 minutes (43 percent) is wasted due to inefficient communications. This equates to an annual loss of more than $265,000 per U.S. hospital. Patient Transfer: Transferring a patient to another facility or home care/hospice takes about 56 minutes, of which an average of 35 minutes (63 percent) is wasted due to inefficient communications. The total annual cost of this waste is about $754,000 per U.S. hospital.